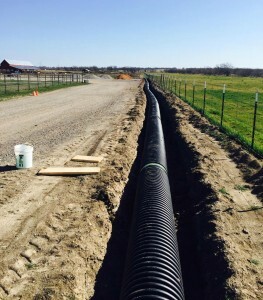 Why is Drainage Important for Your Crops? You all know as we approach planting season, how important it is to prepare the soil properly for your crops. With all the rain we received this winter, it is also important to make sure that your beds drain properly as you water them. Why do we need to pay attention to drainage? Drainage ensures that the soil is properly aerated. If you have excess or standing water it can choke your crops. Drainage reduces soil and nutrient loss from runoff and can help avoid soil erosion. Drainage on hill slopes helps to reduce the risk of soil slippage. Drainage can be collected and saved for future use during periods of dry weather. In preparation for planting our pumpkin crop this year, Farmer Rick is making drainage improvements for the garden areas. As the warmer weather approaches, Preston Trail Farms plans to host talks on garden preparation and composting at our store. We hope you will join us!